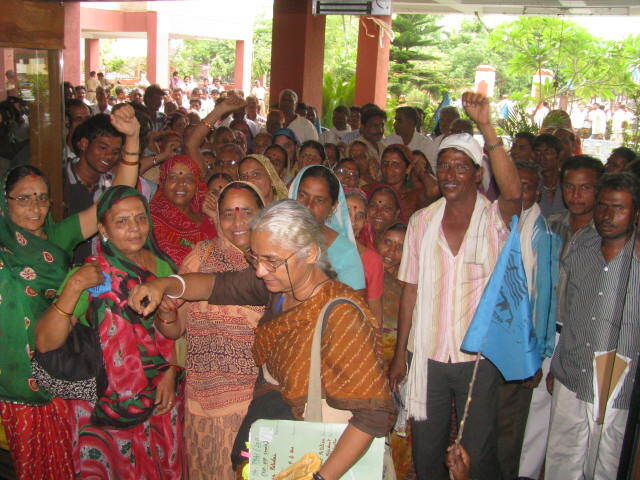 On July 2, about 1,200 women and men from the Narmada valley stormed and occupied the head office of the Narmada Control Authority (NCA), Narmada Bhavan at Vijay Nagar, Indore, which is responsible for taking final decisions on the Narmada project. They were protesting against the Government of India's interim decision to raise the height of the Narmada dam from 122 metres (present) to 138.68 metres (final height), taken on June 27 in New Delhi. Result was, claimed a communique from National Alliance of People's Movements (NAPM), "the final meeting of the NCA with the participating states, Gujarat, Maharashtra, Madhya Pradesh and Rajasthan, to finalize raising of the dam height was postponed". "The decision to raise the dam by the resettlement and rehabilitation (R&R) sub-group of the NCA, chaired by secretary, Union Ministry of Social Justice and Empowerment, was taken despite the fact that it was earlier very critical of the proposal. It knew, not less than 40,000 families in the submergence are being affected even at the present dam height, as they they have not been rehabilitated with entitlements of land to farmers, alternative livelihood to landless, housing plots and amenities at the resettlement sites", the NAPM communique said, adding, "Since 1994 adivasi villages, and since 2000 densely populated villages, are being affected, and the largest number of them are Madhya Pradesh (193)." The communique further said, "The decision was taken on the basis of false claims and reports by Madhya Pradesh, Maharashtra and Gujarat. It was taken as the basis for pushing the dam under political pressures from the Narendra Modi Government. Large sections of people were upset that the decision, which was to be finalized in the full NCA meeting. If the decision to raise the dam was encorsed, it would have been in utter violation of the Narmada Tribunal Award (1979), environmental norms, several judgments of the Supreme Court, and state level rehabilitation policies." "Previously", the communique said, "the height of the dam was raised from 110 metres to 122 metres in a similar manner in 2006 which led to 21 days fast by Medha Patkar, Bhagwati Behan and Jamsing Bhai at Jantar Mantar, Delhi. Thereafter, permission was not granted, as every time it was clear that thousands of families remained to be rehabilitated. In Madhya Pradesh, a judicial commission of inquiry was appointed by the State High Court, when massive corruption was unearthed by farmers themselves. The state government itself had to admit that 686 land purchase registries were fake, while the actual figure could be 3,000 or even more. Inquiry by the Commission is on for the last five years." Then, the Maharashtra government was always taking a stand that rehabilitation of hundreds of adivasis in the state must be completed prior to dam construction and submergence. "Yet"", said its new communique, secretary,rRehabilitation, seems to have misreported the position in the state. It is in this context that the people stormed the NCA office, raising every issue in rehabilitation, environment, cumulative impacts of all dams vis-à-vis regulation in the valley and the costs-benefits of SSP." * R&R sub-group must withdraw its illegal decision, if already taken, and NCA should not finalize the same, admitting that more than 40,000 families are residing in the submergence area and most of those, affected at the present height are also not rehabilitated. * NCA must not submit to pressures from states, but play a major and independent role in strictly monitoring and ensuring compliance with law, policies and judgements on rehabilitation and environment, through frequent field visits and investigation. * Land should be identified for eligible farmers, including adivasis, to rehabilitated them, as per the Narmada tribunal award and Supreme Court Judgements and cash disbursement, as special package, must be stopped, for ever. Maharashtra should not offer cash package to the hilly adivasis in lieu of land. * Right to fisheries should be granted to the fish workers, alternative livelihood to other landless, as per the NVDA’s Action Plan, 1993, recognized by the Apex Court. * All major sons should be rehabilitated, with land, as per the Tribunal Award and Judgement of the Supreme Court, 2005. * No further construction of the dam, including pillars and bridges, should be permitted at this stage, as it would increase submergence by 1.5 metres, as it would be committing contempt of court and people, both. * NCA must ensure that all those who have faced losses (crop), labourers (houses), fish workers (fish, nets and boats) and shopkeepers (shops and material), potters etc. are compensated. The mass action ended at 7:00 pm with agitators warning that if their houses and farms get submerged due to the Sardar Sarovar Project or water was released from upstream dams, as happened last August, they would be compelled to take shelter in the NCA office at the Narmada Bhavan. "They also insisted that NCA must monitor compliance, fully and fairly, without relying on false statistics coming from the state; or else the people would be compelled to lock up the premises. When the Uttarakhand calamity has already taught a lesson, we cannot allow the Narmada valley to face the same, people from the most beautiful and ancient valley warned the officials", the communique said.